This is the way I cook chicken at least once a week; it’s so easy and everyone in the family likes it. The secret to getting the chicken good and brown is to leave it alone while it is cooking. When the chicken is finished cooking, add some butter to the pan for extra flavor. You can add some herbs or a little lemon, too! I like to serve Pan Roasted Chicken with some roasted potatoes and vegetables. Salt and pepper both sides of chicken breasts. Heat a skillet over medium heat and add olive oil. Cook chicken breasts on one side for 5 minutes, or until very brown. Flip chicken and cover the skillet lightly with aluminum foil. Let the chicken cook for 5-7 more minutes, or until the the chicken registers 165° with a meat thermometer or feels firm to the touch (the time depends on the thickness of the chicken). Remove the skillet from the heat, add the butter to the pan, cover with foil and let the chicken rest for 5 minutes. 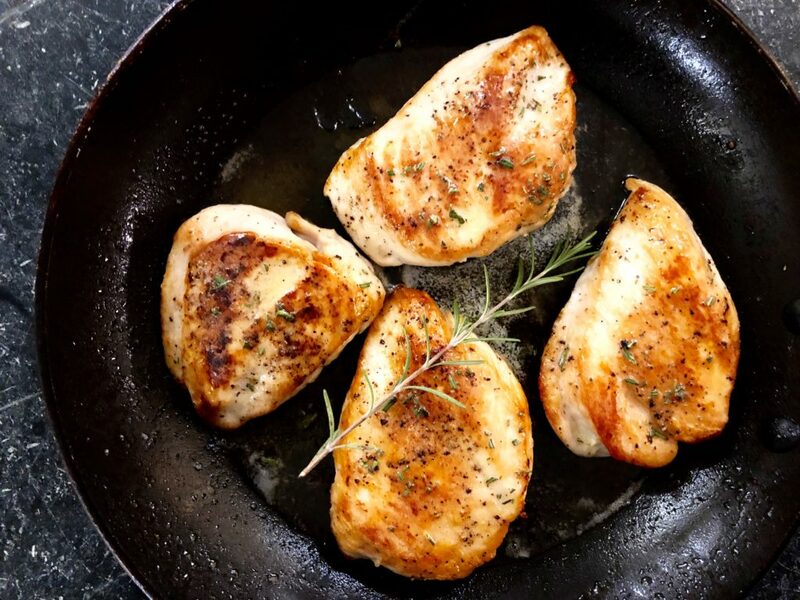 Copyright © 2018 Our Everyday Dinners - This is an easy recipe for how to make Pan Roasted Chicken.